But on the new iPhone 4S, the (GSM) cellular antenna is divided up into two pieces. So if you apply the death grip to attenuate to one piece of the cellular antenna, the radio will, in theory, switch to the other piece that isn't being gripped. So you'll have have to apply a Double Death Grip (see image) to squelch off cellular service to the new phone completely. 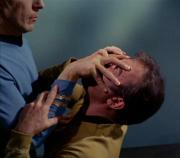 That move is usually seen only on Star Trek and in pro wrestling rings.